Home / EBS News / EBS @ MusikMesse 2012. Day 4! EBS @ MusikMesse 2012. Day 4! The EBS team with Whitesnake's bassist Michael Devin right after the signing. It’s now in the middle of the night. In fact, we turn into summer time now, so the clock just went past 3 AM in the morning, and we’ve been working since 9 AM yesterday. Now it is about time for the resume of the final day at Frankfurt MusikMesse for this year! Saturday at MusikMesse means public day. That means a lot more people on the floor and a background noise over 100 dB. Imagine being in that environment for between 9 AM to 6 PM, and you may understand that it is a good feeling when it is all over, although we had a lot of fun today as well! The day started with Etienne and Swaeli playing from the little stage and continued with an invasion of visitors checking out the gear. We also had the honor to have EBS Pedal Artist Michael Devin from Whitesnake doing a signing at EBS, before he played at the Agora stage together with his bandmates Doug Aldridge and Brian Tichy. At the end of the day, Final Virus played the Agora stage with EBS Artist Peter Sonntag and EBS Pedal Artist and guitarist Reno Schnell. 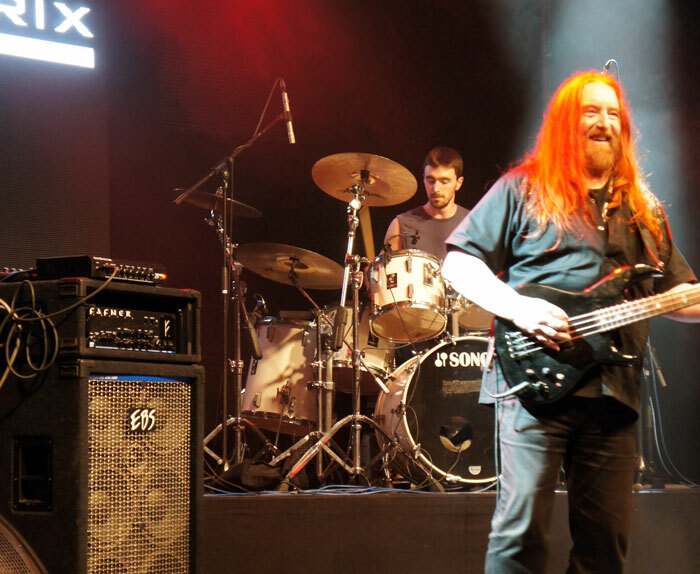 Peter did the gig on the EBS Reidmar driving his ProLine 610 cabinet and the sound was huge! Speaking of the Reidmar. That mean little amp seems to be the talk of the town! Numerous visitors came by to give it a try because they had heard good things about it, and many just came to share their love for this beautiful amp, leaving a great feeling about the future for EBS! The new little Session 30 combo and the new and improved HD 360 did great as well, and we can’t wait to present some of the stuff we are developing right now! It is exiting times indeed! Some of the other highlights of the day included a jam with Etienne, Swaeli and Israeli bassist Edmond Gilmore, as well as some really funky playing from Yolanda Charles checking out the Stanley Clarke Signature Wah. Now we will go back to Sweden and get some real work done, following up the leads from the show, and continue working on developing the most amazing gear for you guy’s to enjoy! We’d like to mention all our friends that where kind to offer us instruments to have at the show, so give it up for Marleaux basses, Vychodil basses, PRS Guitars, Sandberg basses & Kala U-Bass, as well as Tsunami Cables that we are using at shows and at our showroom in Stockholm, great cables! Also worth mentioning are Lairat basses and KDS basses, that used EBS amps to demo their instruments. Now let’s catch some sleep, but stay tuned for a couple videos to be posted later this week, and see you all at Frankfurt MusikMesse 2013! EBS @ MusikMesse 2012. Day 3.